One glass ball ornament, preferably gold or silver. Three small brown or tan puff balls, approximately 1/2 inch diameter. Two pieces of red, brown, or tan felt. One small red puff ball, approximately 1/4 inch diameter. Two google eyes, medium size. 1. Glue one of the puff balls to the middle of the ornament for a snout. Glue the smaller puff ball to the end of the 'snout' for a nose. 2. Double the felt and cut the felt to resemble antlers. You want the felt to be stiff enough to stand up, so use thick felt or use multiple layers. 3. 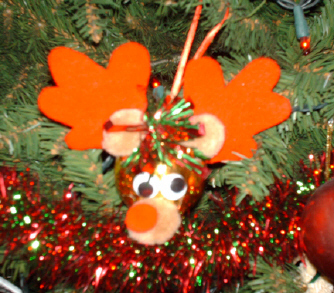 Glue the antlers to the top of the ornament, and glue the two puff balls in front of the antlers to resemble ears. 4. Glue the eyes between the ears and the nose.